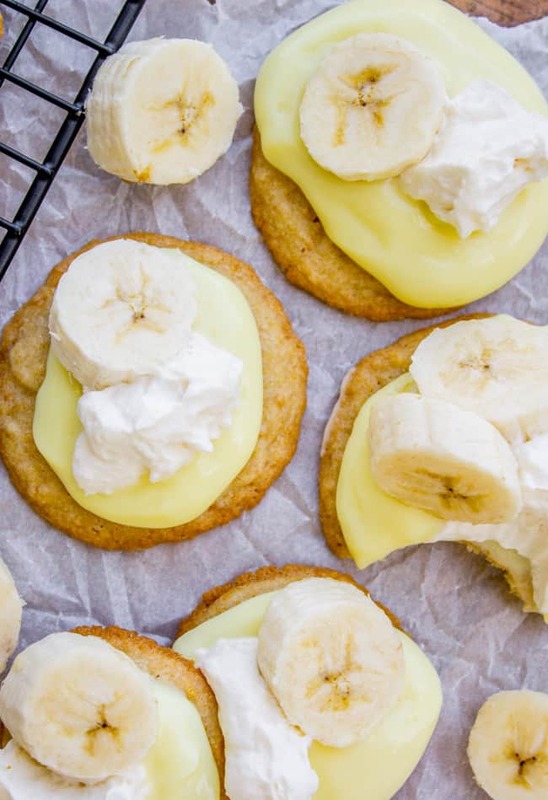 These cookies taste like mini hand-held Banana Cream Pies! It’s a cookie (made with graham cracker crumbs) topped with pudding and cream cheese whipped cream. A perfect summer treat for a crowd! And that was the moment that I decided I would never leave the house without eyeliner again. Actually, what am I saying. This is a clear sign that I should never exercise again. NO SWEATING AGAIN, EVER. 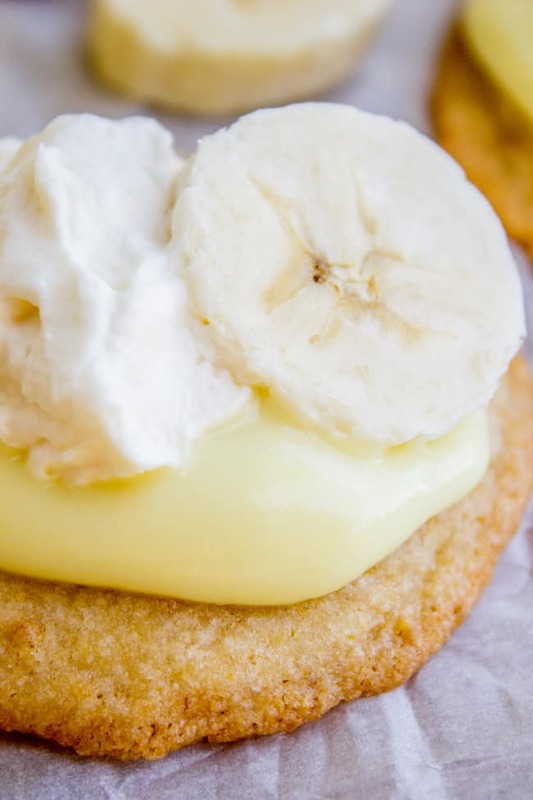 Instead I will eat Banana Cream Pie Cookies while I ruminate on the fact that I turn 30 this year. I SAID RUMINATE, NOT SOB. 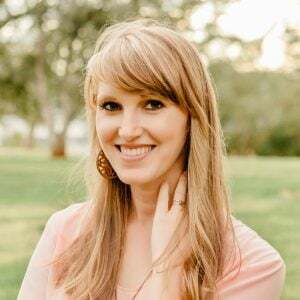 Amber’s husband requested a Banana Cream Pie for dessert on Easter, but it was a pretty big gathering and pies are not good desserts for a crowd. (Unless you want to make like 3 of them, and she did not.) So instead she made these cookies. After eating 5 of them (okay maybe 3) I asked her what was in everything so I could make them at home. She said she used a Spritz cookie recipe and replaced some of the flour with graham cracker crumbs. If the cookie puffs up, just tap with a spoon or spatula. Whipped cream on the left, and on the right is after I mixed in the cream cheese. The cookies themselves are soft and super buttery. 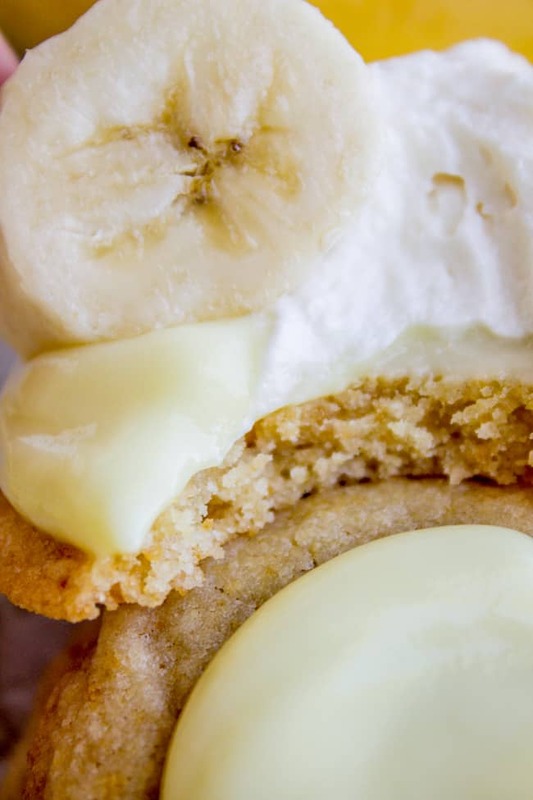 The graham crackers add just the right touch. They are a bit crisp on the edges, just how you would want the edge of your pie to be. Obviously these are an assemble-last minute type of cookie. The pudding will make the cookie soggy eventually. But if you have a bunch left over, you could always trifle it for later. Or serve it this way to begin with! It’s so pretty! 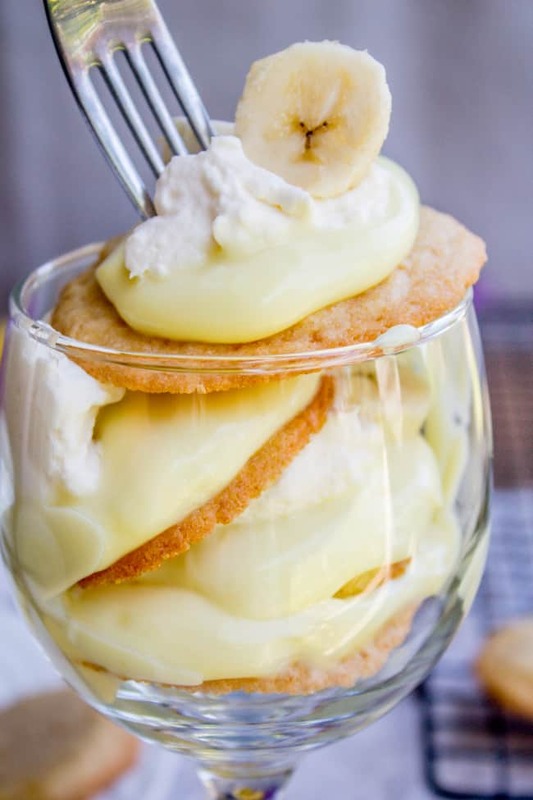 Break up the cookies and throw it all in a trifle bowl. Oh my gosh, I almost forgot about the cream cheese whipped cream. It’s cream cheese that is beaten, then you make regular whipped cream and fold in the beaten cream cheese. It’s so much more interesting than regular whipped cream! I love it! 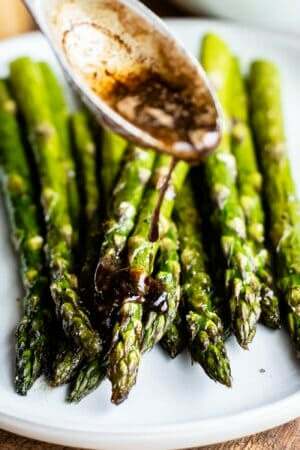 Preheat your oven to 350. Line 2 large baking sheets with silpats or parchment paper. 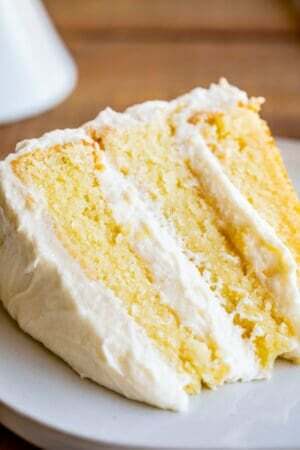 In a large bowl or stand mixer, beat the butter and sugar for 2 minutes until light and fluffy. Scrape the sides and bottom of the bowl with a spatula. Add baking powder and salt. Stir to combine. Add egg and almond or vanilla extract and beat well. Add the graham cracker crumbs and the flour and stir just until combined. All the flour streaks should be stirred in. 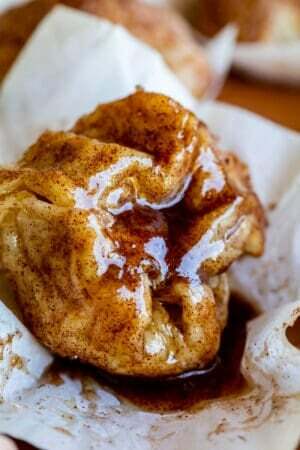 Shape the dough into large walnut sized balls of dough and place on the baking sheets about 2 inches apart. 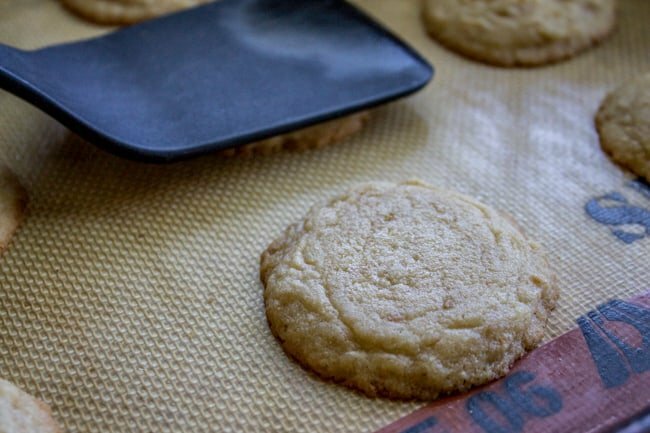 Bake at 350 for 9-12 minutes until they have just barely lost the shine on top of the cookie. 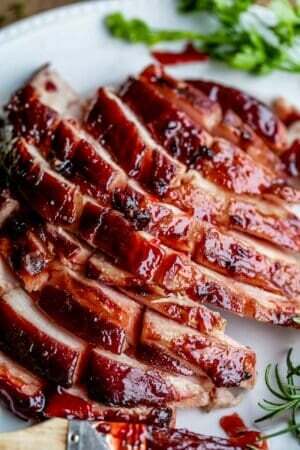 Let cool on the pan 5 minutes, then remove to a wire rack and let cool completely. Meanwhile, make the pudding according to package instructions. Chill in the fridge. 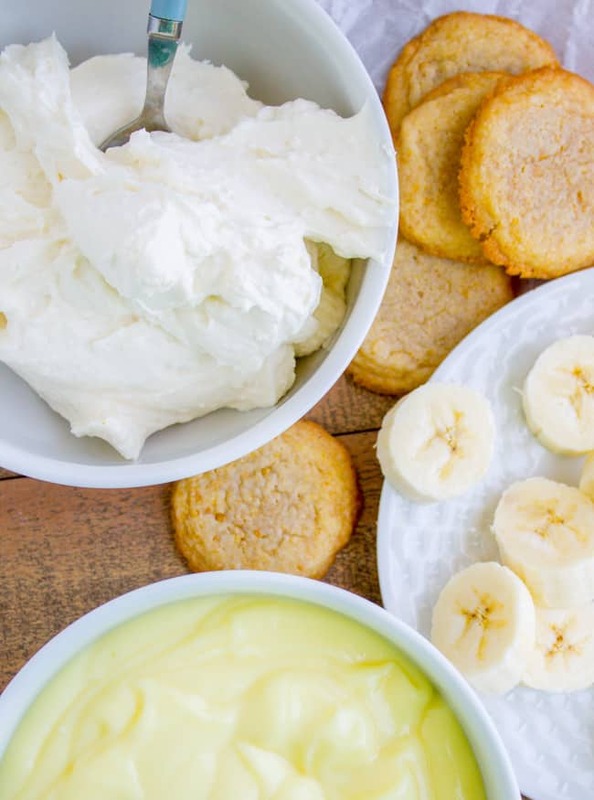 Make the cream cheese whipped cream. 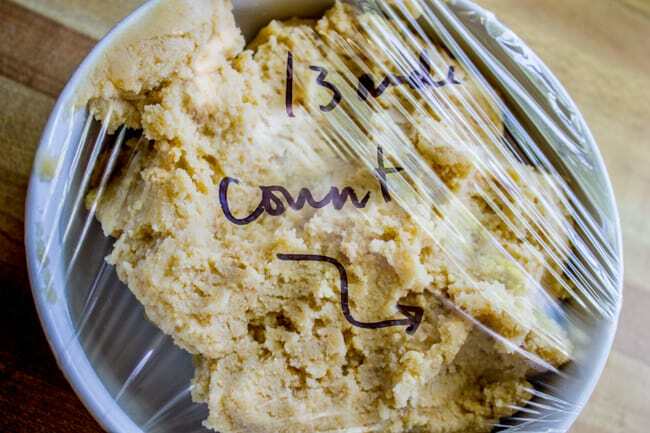 Add the cream cheese to another large bowl, or wash the one you used for the cookies. Beat the cream cheese until it is very smooth, making sure to scrape the sides and bottom of the bowl. Scrape the cream cheese into another small bowl and set aside. In the same mixing bowl (no need to wash), beat the cream on high speed. Add the vanilla, salt, and powdered sugar. Beat for 2-4 minutes until soft peaks form. Add the cream cheese back into the whipped cream. Stir until combined. 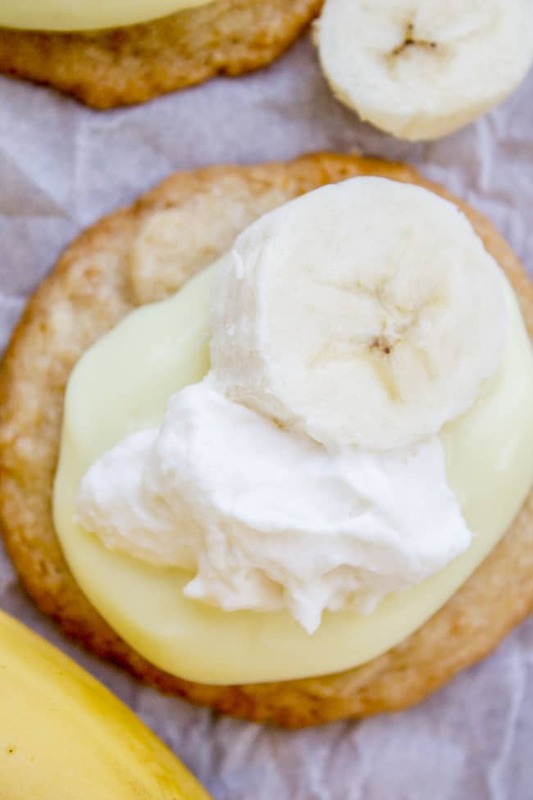 To assemble cookies, spoon a dollop of pudding onto the center of a cookie, then top with a spoonful of cream cheese whipped cream and a banana slice. If you have leftovers, throw it all in a bowl and call it a trifle! *I used almond extract because that's what I usually put in Spritz. And I forgot that I was going for Banana Cream Pie flavors. I really liked it with the almond though, so I'm leaving it, but feel free to replace with an equal amount of vanilla. 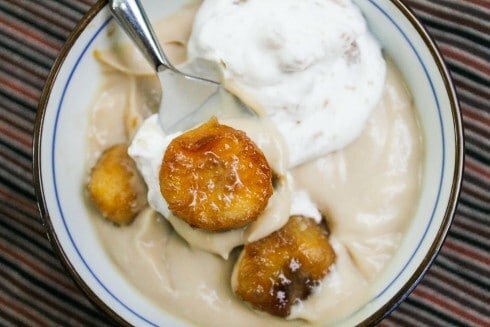 Butterscotch Pudding with Roasted Banana Whipped Cream << this photo is a sin guys. But I STILL make this pudding all the time. It’s so easy and people are always impressed. 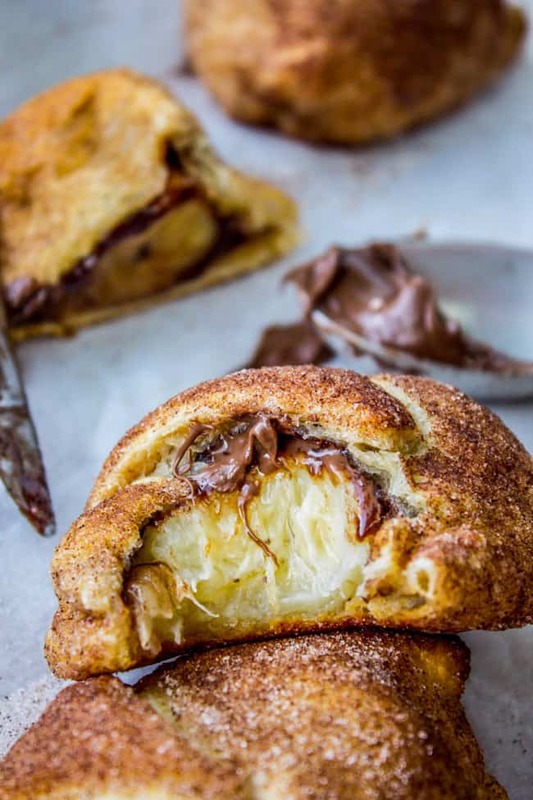 Nutella and Banana Stuffed Crescent Rolls << These are so popular! I just saw that they passed half a million pins on Pinterest. Crazy! 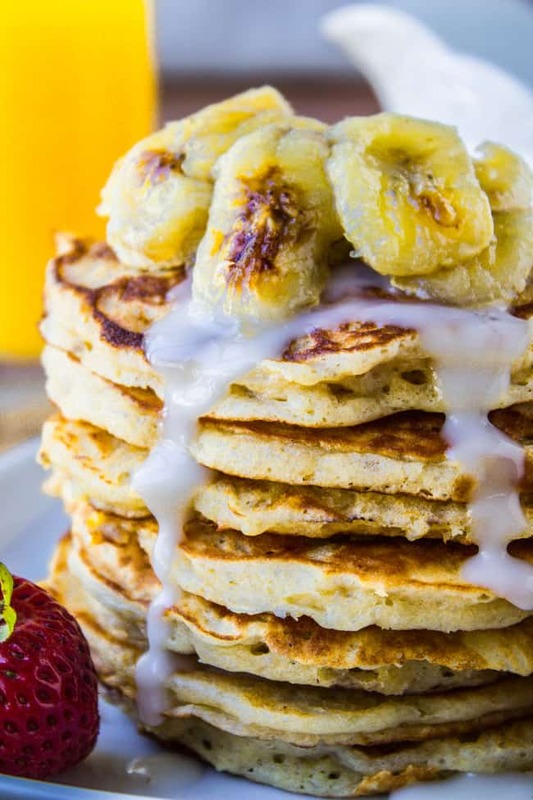 Banana Macadamia Pancakes << have you ever had these in Hawaii? It’s a thing. 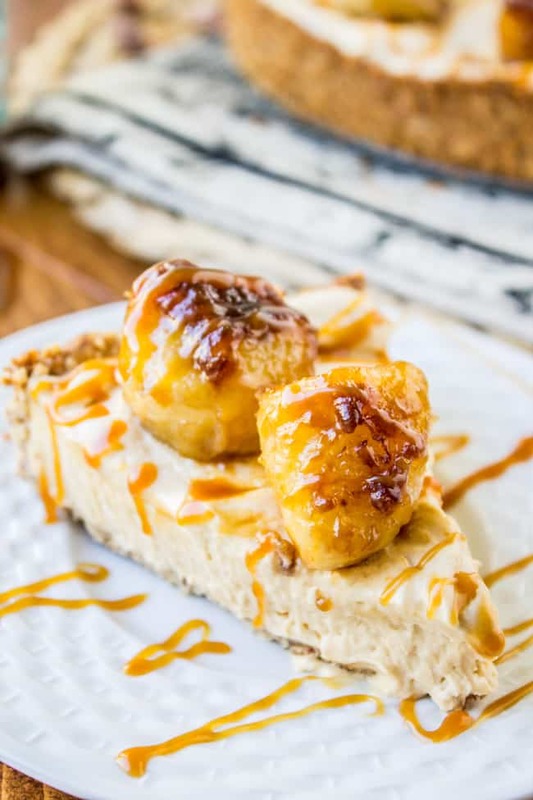 Check out these other desserts that spin off Banana Cream Pie! Yeah Amber is a genius! I never would have put cream cheese in whipped cream but now I’m never going back!